Level: Intermediate-level, on/off-trail, map-and-compass, winter camping. Difficulty: Moderately strenuous for the fit; cold/foul weather; snowy, wet, slippery terrain. Prerequisites: Participants must have prior cold-weather backpacking experience. Costs: This is a free trip. Transportation, lodging, meals, public transit, permits, etc., are the responsiblity of each participant. Organizer: Michael Neiger (LandNavMan on the boards), Marquette, Michigan (Web site; e-mail; bio). Sign-up process: After reviewing the material presented below, e-mail your first name, last name, trail name, city, state (or province), and e-mail address to Michael Neiger (LandNavMan). and fellow members of the North Country Trail Association. The man [woman] with the knapsack is never lost. and home is wherever he may choose to stop. 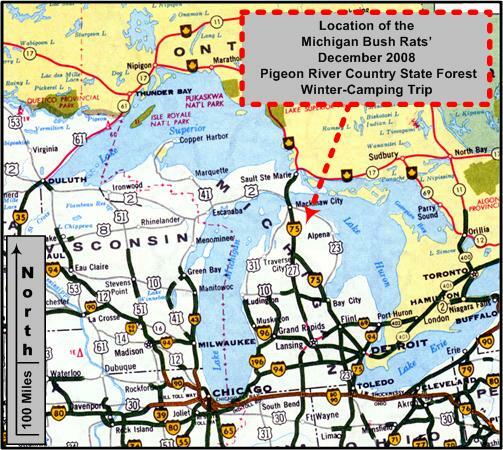 The Michigan Bush Rats' December '08, 4-day, on/off-trail, winter backpacking trip will see them exploring the southwestern corner of the 93,000-acre Pigeon River Country State Forest, including the 6,300-acre Green Timbers Wilderness Tract, in the northern Lower Peninsula of Michigan. This area is traversed by portions of the High County Pathway and the Shore-to-Shore Trail as well as the Sturgeon and Pigeon Rivers. Since this area is home to the majestic Elk, we'll be keeping an eye out for this elusive animal. In lieu of the real thing, we'll be watching closely for signs of its passing: ground spoor (tracks, scrapes, sheds, and bones) and aerial spoor (rubs, hair). .......after breakfast at our campsites, we drove down to Clear Lake State Park, where we would leave most of our vehicles for the duration of the trip. Cathy was there as were Josh and Mary Ann, who had driven down from the Canadian Soo. Mike's car was spotted elsewhere so he could leave on Sunday to get back to work. Before long, we began our hike, which was to be a sizeable loop, east of the park, in the Mackinac State Forest. After crossing M-33 we cut a rough azimuth to the east, over a ridge, before heading south a bit to pick up one of the many firebreak trails in the woods. Traveling on this firebreak would facilitate covering ground since we were getting a relatively late start. Though the sky had been overcast at daybreak, it was now a bright blue with puffy, white, fast-moving clouds. With the temperature in the high twenties and almost no wind, it was very pleasant hiking weather. By lunchtime we had seen an assortment of tracks--turkey, squirrel, mouse, deer, coyote and elk. We stopped to eat along one of the trails. When we got moving again, we spotted an eagle soaring high above the trees. Steve expressed an interest in the land nav and Michael set him up to cut an azimuth on point. He did an excellent job despite having to contend with the thick brush and swamp that covered the low ground between the ridges. alien invaders actually: spotted knapweed and the tall spikes of mullein. The field was bordered with a young mixed forest--aspens, beeches, and maples with a scattering of birch and evergreens. We found a sheltered area along the north edge and began to set up camp. When completed, our little village had an assortment of shelters--Mike's Snow Cave, Steve's heated tent, Josh's pyramid shelter, and several, variously-erected tarps. We settled in to enjoy our view of the field as we prepared dinner and relaxed for the evening.......read more of NatureLady's photo-journal. This free, moderately-strenuous, map-and-compass, on/off-trail winter-backpacking trip is suitable for the adventurous, intermediate-level, independent, fully-equipped, 10-degree, foul-weather, substance-free (tobacco, alcohol, illicit drugs), swimming-proficient, adult, winter backpacker with a strong mind and body who enjoys exploring off-the-beaten-path wilderness and bivouacking in remote, non-campground settings. Since our area of operation will likely be snowfree, and we will be bivouacking in pristine, highly-combustible, non-campground settings, we will not be having any campfires (or using any twig-burning-type hobo stoves) except in an emergency. Everyone should be equipped with the necessary insulating layersleg, torso, and headto stay warm and stave off hypothermia at rest, especially at lunch when it is cold, rainy, and windy. Everyone should be carrying a lightweight backpacking stove for heating water and cooking their rations. One Thursday-night bivouac option is the Green Timbers Wilderness Tract parking lot situated along the north side of the Sturgeon Valley Road, just west of the bridge over the Sturgeon River. Our 8:00 am Friday morning assembly location will be the Green Timbers Wilderness Tract parking lot situated along the north side of the Sturgeon Valley Road, just west of the bridge over the Sturgeon River. This parking lot is located in Section 21 (Township 32 North, Range 2 West), about 6 or so miles east of the Vanderbilt Exit No. 290 on I-75. The parking lot's approximate UTM coordinates are 0691540mE 5001900mN, Zone 16, Datum NAD 27. There will be no means of contact. After signing waiver forms, we'll depart to spot our vehicles about 9:00 AM. But he [she] shuns the shadow of oak and pine. In addition to exploring the Green Timbers Wilderness Tract and Sturgeon River Wateshed, we'll also trek eastward, into the Pigeon River Watershed. If all goes well, we should arrive at our vehicles about mid-afternoon on Monday. Additional itinerary info may be posted at a later date. The 93,000-acre Pigeon River Country State Forest consists of seven campgrounds, over 90 miles of hiking trails, 27 miles of horse-riding trails, numerous limestone sinkhole lakes, and several rivers. After heavy logging between 1860 and 1910, the area suffered disastrous, uncontrolled fires for years. Fires burned significant acreage as late as the 1930's. Unsuccessful attempts to convert the land to farms resulted in large parts of the area reverting to State of Michigan ownership through either tax reversion or purchase. In 1919, the area was designated a state forest and tree planting began soon thereafter. Planting and forest recreation development expanded with the establishment of a Civilian Conservation Corps Camp in the region. The headquarters buildings along the Pigeon River were built between 1934 and 1935. Seven elk released in 1918 increased to as many as 500 by 1927. Illegal shooting of elk in 1974 resulted in a record-high loss of 45 animals. By 1975, the herd was estimated to number only 200 animals. The herd eventually recovered and now exceeds 1,100 animals, making it the largest wild elk herd east of the Mississippi River. To control crop damage and allow forest regeneration, limited harvests of the elk are scheduled from time to time. In addition to elk, the region is inhabited by deer, bear, bobcat, coyote, grouse, woodcock, snowshoe hare, squirrels (gray, black, and fox), pine martin, beaver, otter, muskrat, waterfowl, and numerous songbirds. After the discovery of gas and oil deposits under the south-central portion of the region in the 1970's, commercial exploration and development began. By 1984, nearly 857,000 barrels of oil and 9,200,000 million cubic feet of gas were being removed from the area annually. Scenic vistas, prime wildlife habitat and over ten miles of Sturgeon River frontage dominate this 6,300-acre tract. Adopted as part of the Pigeon River Country State Forest in 1982, Green Timbers is closed to all motor vehicles, including snowmobiles. Green Timbers, so named in 1942 by Don McLouth of McLouth Steel, was developed and used as a hunting and fishing resort. Prior to McLouth ownership, the southeast portion was used as a recreational retreat by Titus Glen Phillips, while the north portion was owned by Cornwall Lumber Company. The land was extensively logged, burned, and then grazed by both sheep and cattle prior to the 1950's when McLouth purchased the property. The logging, fires, and heavy grazing are still evident to the observant eye. About 55 percent of Green Timbers is covered with a mixture of aspen, oak, northern hardwood, swamp conifers, red pine, and white pine. The remaining 45 percent consists of open grasslands and scattered pine stumps or open grown hardwoods. Green Timbers has been an important area for elk since the successful reintroduction of the species in 1918. The original release site is just 1.5 miles north of the property. Large open expanses of grassland as well as annual seeding of rye, buckwheat, clover, and alfalfa by the Wildlife Division of the Michigan Department of Natural Resources provide prime habitat for elk. Swampland (lowland forest), aspen, and hardwoods offer habitat for rugged grouse, turkey, bear, white-tailed deer, woodcock, snowshoe hare, and a variety of other wildlife species. The Sturgeon Valley watershed, including the Sturgeon River, Club Stream, and Pickerel Creek, contains healthy populations of brook, brown, and rainbow trout. The Green Timbers Tract includes two, hike-in log cabins that are open to the public on a first-come, first-served basis. The one-story Honeymoon Cabin overlooks the Sturgeon River Valley from high atop its east escarpment in Section 10. Its west-facing porch--which is highly exposed to west winds--offers magnificent views of the valley below. It is heated by a massive, fieldstone fireplace. The Green Timbers Cabin is situated at the bottom of the Sturgeon River Valley along the east bank of the Sturgeon River, just north of the confluence of Pickerel Creek and the Sturgeon, in Section 10. It too is heated by a massive, fieldstone fireplace. Field Guide to the High Country Pathway, 1997, booklet with topo maps keyed to text, by the Pigeon River Country Association, P.O. Box 122, Gaylord, Michigan 49734-0122 ($5, 24 pages). High Country Pathway & Pigeon River Country State Forest Map, 2007, by the Pigeon River Country Association, P.O. Box 122, Gaylord, Michigan 49734-0122 ($7.50, waterproof map). High Country Pathway Map , 1990 map with text, Michigan Department of Natural Resources, Information Services Center, P.O. Box 30028, Lansing, Michigan 48909. Green Timbers Map, 1993 map with text, Michigan Department of Natural Resources, Information Services Center, P.O. Box 30028, Lansing, Michigan 48909. Hiking Michigan book, by Mike Modrzynski (Falcon Press, 1996). Backpacking in Michigan book , second edition, by Pat Allen and Gerald L. DeRuiter (University of Michigan Press, 1989). "Hiking with the Herd," by James Campbell, in Backpacker Magazine, Oct '00, page 97. The Pigeon River Country--A Michigan Forest book, by Dale Clarke Franz, et al., by the Pigeon River Country Association, P.O. Box 122, Gaylord, Michigan 49735 (300 pages; history of gas exploration and preservation efforts). Pigeon River Country State Forest Map, 1985 map with text, Michigan Department of Natural Resources, Information Services Center, P.O. Box 30028, Lansing, Michigan 48909.
in craggy garden nooks full of Natures darlings. Natures peace will flow into you as sunshine flows into trees. Since we will be bivouacking on State-owned land during our trip, we will need to post free Camp Registration Cards (see below). Pre- or post-trip lodging, meals, and campsite fees are optional and the responsibility of the participant. There are no other fees or costs to participate in this trip. Anyone bivouacking on land owned by the State of Michigan outside the boundaries of state parks, state forest campgrounds, etc., is required by state law (Natural Resource and Environmental Protection Act, Sec. 74201 et seq., P.A. 451 of 1994) to post a Camp Registration Card (Form no. PR 4134; view sample copy) at their bivouac site. Notice: Backpackers have been ticketed and fined for not posting Camp Registration Cards in the past. This permitwhich is freemust be filled out in pencil (to make it legible when wet). Since this two-part permit is perforated (for partial removal by Department of Natural Resources officers) and made of heavy cardstock (to withstand weathering), it can not be reproduced. These 8.5- by 11-inch permits can be picked up free at any Michigan Department of Natural Resources (DNR) office. They can also be ordered by the DNR by e-mail. No permits are generally required to bivouac on federal land outside the boundaries of national parks, national lakeshores, national forest campgrounds, national recreation areas, etc. Anyone bivouacking on Crown landproperty owned by the Province of Ontariooutside the boundaries of a provincial park, national park, etc. is required by provincial law to purchase http://www.mnr.gov.on.ca/fishing/crownland.htmlCrown Land Camping Permits. These permits cost $10.00 Canadian per night, per person and are generally available from any Ontario sports shop that sells hunting and fishing licenses, such as the one below, which is conveniently located along the east side of Highway 17 on the northern outskirts of Sault Ste. Marie, Ontario. You'll further reduce the chances of your food getting ruined if moisture penetrates the food bag itself as the moisture will still have to work its way into each and every individual ration unit. Meticulous ration planning, measuring, and packaging is tedious, but its essential for safe and successful long-range recon of remote wilderness. We must be extremely careful with our cooking stoves and when burning bug coils to make sure we don't start a ground fire, which has happened more than once on past trips of ours. Please bring a fire-proof stove base (aluminum pot lid, etc.) for your stove and bug coils. During snow-free periods, we will NOT be having any campfiresor burning any hobo stovesunless we find a very, very safe area, such as an open mud-gravel-or-sand-covered area immediately adjacent to water. If a fire ban is in effect, which is sometimes the case during the summer, we will not have any fires. To prevent accidental ground fires during snow-free periods, everyone must have a heat-resistant, fire-proof stove base. This has been a problem in the past with both solid fuel (Esbit) stoves as well as liquid fuel stoves, especially MSR-type stoves. If the weather is very hot, come prepared to do battle with swarms of mosquitoes, black flies, no-see-ums, ticks, and biting beach flies while hiking, swimming, eating, and bivouacking. Loose-fitting, tightly-woven, full-coverage, light-colored clothing treated (saturated) with permethrin (e.g. : Repel's Permanone Clothing and Gear Insect Repellent) before the trip combined with liberal doses of 100% DEET (e.g. :Muskol's Maximum Strength 10-hour 100% DEET Insect Repellent; Repel's 100% DEET Insect Repellent), a head net, and a love of the outdoors should do the trick. Since they are so critical to one's sanity, bring an extra bottle of DEET and an extra headnet. If you are going to experiment with alternatives to DEET, pack some 100% DEET anyway as most experienced deep-bush travelers swear by it when all is said and done, especially most Bush Rats, who bivouac sans tent. A supply of smudge-creating bug coils (e.g. : Pic Mosquito Coils) are also a staple of most deep-bush travelers (note: a flat, fireproof base must be used under these to prevent accidental fires). less than 40 instances of toxicity appeared in the medical literature. It is highly recommended that some form of eye protectionsafety glassesbe worn while bushwhacking as several trippers have suffered near-incapacitating eye injuries on past trips. This is a tour, not a basecamp-type trip. We will move everyday, bivouacking in a different location each night. Reduce the threat of thefts or vandalism to your car by keeping it locked, relatively empty, and uninviting looking. To help stymie gasoline theft or vandalism, consider using a locking gas cap. The expense of a locking gas cap$10 or $20will look pretty cheap compared to the alternatives: having to get someone to haul gas to your remote location, much less have your car towed and repaired after vandals contaminate your gas tank. All persons participating in a Bush Rats trip or expedition organized by Michael Neiger must read, acknowledge understanding, and sign a liability waiver at the trailhead. No high-cotton-content clothingsave a bandana or twois allowed to be worn or carried for safety reasons. When wet, cotton is VERY hard to dry and often leads to hypothermia. Wool or synthetic clothing fashioned from nylon, supplex, polypro, fleece, or microfibers are much safer and easier to manage during prolonged bouts of foul weather. An on-your-person, in-pocket, survival kit (knife, waterproof matches, firestarters, compass, and whistle) secured with a loss-prevention lanyard is highly recommended. The beginning of wisdom is a salutary shock. Bring an adequate amount of water to the trailhead as there is generally no water available. Everyone should have the containers (Nalgenes and bladder) to hump 4 quarts of water when needed. While we often trek with just a quart or so of water in our rucks, when we range far from waterlike when we bivouac long distances from surface waterwe will fill up all our containers so we can remain independent for an afternoon of bushwhacking, dinner at night, breakfast, and a morning of bushwhacking. To keep your gear dry during foul weather, consider lining the main compartment in your rucksack with a huge, heavy-duty "contractor-grade" plastic bag. Critical items within the "contractor" bag, such as clothing, sleeping bag, and rations, should be further protected from moisture by lining their respective stuff sacks with heavy-duty "garbage-compactor" bags. Avoid using regular garbage bags as they tear much too easily on long, rugged trips. It is recommended that you carry a water bottle and snacks on your waistbelt in separate pouches so you can snack and sip water while underway, without stopping to take your pack off. Regular snacking and hydration are essential for avoiding dehydration, hypothermia, and exhaustion, especially when things get challenging, like late in the day or during foul weather. If you are allergic to bee stings, consult your physician about carrying an injectable epinephrine unitsuch as an EpiPen or Ana-Kitin your rucksack. Canadian money: You may want to consider getting Canadian money from your local bank before the trip, or using one of the money exchange services located in Sault Ste. Marie, Canada, if they are open when you cross the boarder. Currency exchange calculators on the Net include XE.com or X-Rates. Identification: Bring appropriate identification with you to reduce problems getting into Canada as well as back into the United States. If you don't have a visa, you must have a copy of your birth certificate to establish your identity. Prescription medications: If you are carrying prescription medications in your first-aid kit or elsewhere that are not in a properly-labeled container, it may be a good idea to stow the original, labeled containers, with at least one example pill in each, in your vehicle to reduce problems with Canadian and U.S. customs officials. The tendency nowadays to wander in wilderness is delightful to see. but as fountains of life. Wilderness tripping and expeditioningespecially remote, foul-weather travel, bushwhacking cross-country, cliff and steep slope travel, climbing, canyoneering, cave exploration, river fording, swimming, canoeing, portaging, skiing, snowshoeing, winter camping, ice travel, ice crossing, deep cold, high winds, etc.involve unknown and unpredictable hazards and perils. On Bush Rats trips and expeditions organized by Michael Neiger, the only first-aid equipment available is that which is carried by each participant. Each participant should carry their own first-aid kit, which should be stocked with the items and medications recommended by their personal physician. We need the tonic of wilderness. . .
On Bush Rats trips and expeditions organized by Michael Neiger, there are no doctors, nurses, EMTs, paramedics, or other trained emergency medical personnel. At best, other participants may only be able to render the most basic of first-aid care. On Bush Rats trips and expeditions organized by Michael Neiger, no one is trained in rope handling, rappelling, climbing, caving, ice travel, high-angle slope travel, swift-water travel, etc. No one is trained in rescue from any of these activities either. There are no search-and-rescue personnel, and no one is trained in high-angle rescue, ice rescue, swift-water rescue, etc. On Bush Rats trips and expeditions organized by Michael Neiger, emergency communications gear such as cell phones, satellite phones, and satellite beacons (ELTs, PLBs, & EPIRBs) are not provided. Even if a participant carries SAR-comm gear, it can't always be relied upon, especially in rugged terrain, remote bush, or extremely harsh weather. The only way to summon search and rescue personal or emergency medical personnel on Bush Rats trips or expeditions organized by Michael Neiger is for another uninjured participant to walk, snowshoe, or paddle to a point where help can be summoned. The wait for assistance may be very longsometimes measured in daysand could possibly be very painful, maybe even fatal. Since the evacuation process will be very difficult and costly to arrange, participants should consider purchasing evacuation insurance and carrying their own communications gear. Louis Pasteur (1822-1895), French biologist & bacteriologist. In the setup menu, key-punch in your name, address, and phone number so if your GPS is lost and found by a willing party, it can be returned to you. To keep up to date on the latest developments on this trip as well as learn who else is going, point your Internet browser to the trip's discussion thread (message board) on Backpacker Magazine's Midwest Forum Web site. which, if we unconsciously yield to it, will direct us aright. To review journals and photo albums from Michigan Bush Rats' trips and expeditions, visit the RuckSack's Journals and Photos Page. To review photos of sheds discovered on Michigan Bush Rats' trips and expeditions, visit the RuckSack's Sheds and Skulls Page. rather than the ones you did do. and give strength to body and soul alike. recreation grounds for soul and body. In the school of the woods there is no graduation day. If this sounds like your kind of wilderness adventure, kindly e-mail your first name, last name, trail name, e-mail address, city, and state (or province) to LandNavMan (Michael Neiger) of Marquette, Michigan. Thank you.